More than two years ago I took my very first star trails image (shown here) and wrote a post on shooting star trails. I’ve learnt a lot since then and as I’ve been shooting stars (Milky Way) and star trails recently plus there has been some interest in learning strategies and technique for this, I thought I’d put together a series of more detailed posts on the topic. This first post will go through some of the gear selection and planning for shooting stars. In a follow up post I’ll cover the in the field technique and settings to use to take the images. 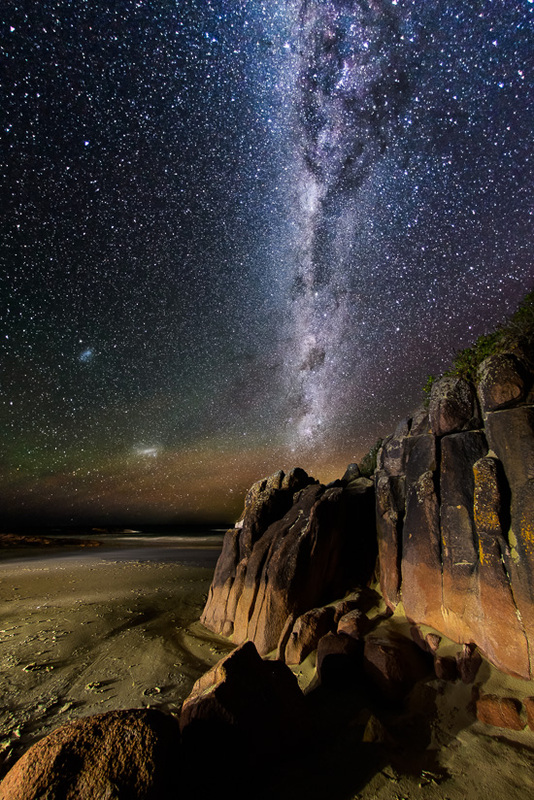 An expensive pro level camera is not required to take good Milky Way or star trails images. Any camera with full manual controls and a relatively decent ISO performance (can shoot up to ISO 1600) is perfectly adequate for star trails. For static star (Milky Way) images you may want a higher ISO performance (ISO 3200/6400). You will also need the ability to specify manual settings and ideally with the ability to select a bulb mode for long exposures. A fast wide angle lens is probably the most important piece of gear for shooting stars. I recommend a focal length of around 35mm or less on full-frame cameras, 24mm or less on APS-C cameras and 16mm or less on Micro 4/3 cameras. You can definitely go much wider than this starting point – I often shoot down at around 14/15/16/20mm on a full-frame camera. There are two reasons for this – wider angles allow you to use longer shutter speeds which allow you to gather more light (see the 500 rule in the next post). Secondly the sky and universe is a pretty broad expanse so a wide field of view from the lens allows you to capture more of it along with an interesting foreground. 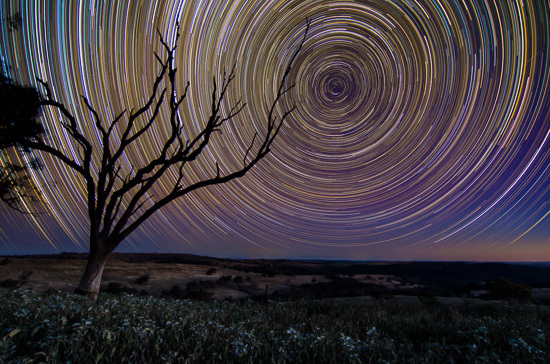 You’ll notice this even more when taking star trails. The darker the conditions the lower the f/number you will be able to use and you will be able to capture the fainter stars. It also allows you to shoot at a lower ISO whilst maintaining the same “exposure” for less noisy images and a higher signal to noise ratio. At a minimum a lens which can shoot acceptable images at f/4 would be required and anything faster (e.g. f/3.5, f/2.8, f/2, f/1.8 and f/1.4) is progressively much better. You may want to keep the lens warm and protected to prevent dew formation (lens hood and I have used some woollen socks wrapped around the lens) – this is only a requirement if the ambient temperature and humidity is such that dew might form. If you’re interested in much more detail about this topic with detailed information on a much larger set of available lenses then please check out Ian Norman’s excellent How to Pick a Lens for Milky Way Photography. Your exposures are going to be long (at least many seconds and perhaps many hours for star trails) so you want your camera to remain perfectly stable for the entire time. A remote cable release will allow you to take shots without having to touch/bump or move your camera. Ideally (and for star trails it’s essentially a requirement) you want one with an intervalometer function – some cameras have this function built in but personally I still like to drive this externally – that way I can make changes to the program and settings without touching the camera itself. These can be bought extremely cheaply (e.g. on eBay) for around $20 for a wired model and from $40-$100 for a wireless model. Both for your camera and also your intervalometer. If you are taking star trails these will be running constantly perhaps for many hours and will drain power quickly. A single large battery, spare batteries or battery grip to last the desired number of frames (remember also that batteries last less in the cold). If you want to conserve power also manually turn off your LCD/image review. It will be dark so you won’t be able to see, and you may also find it useful to create some lit foreground images to blend with later in post production. A Star Location App will allow you to find where the Milky Way is and will be (if you can’t already see it with the naked eye) and for star trails will also allow you to find the celestial pole). 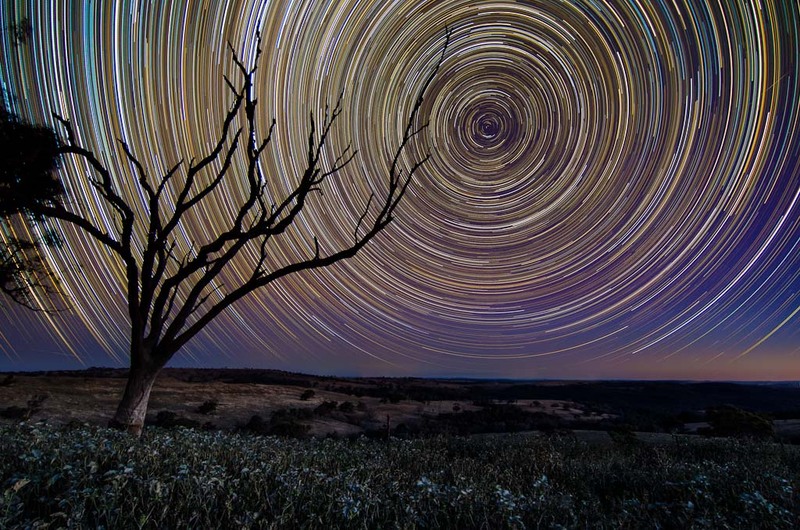 I knew if I wanted to have the trails appear as a circular pattern around a central point in the sky I’d need to point roughly south (actually they spin around the Southern Celestial Pole (in the southern hemisphere – for folks in the northern hemisphere you want the northern pole star)). I use an IOS app called SkySafari or StarTracker so I can locate where Sigma Octantis (the closest thing to the southern pole star) is going to be in the sky. Two excellent photo planning applications are The Photographer’s Ephemeris (TPE) for IOS & Android and PhotoPills for IOS, which will allow you to plan for moonrise, moonset, the phase of the moon, sunrise and sunset. In the next part I’ll cover some of the in the field technique and settings to use to take the images.